Life is better when it's filled with rainbows, glitter, and unicorns. The brightly colored manes and shiny horns of unicorns have fascinated people of all ages for centuries. However, they have grown more popular over the last couple of years. While adults may not realize it, playing with unicorns adds a sense of magic to every childhood adventure. 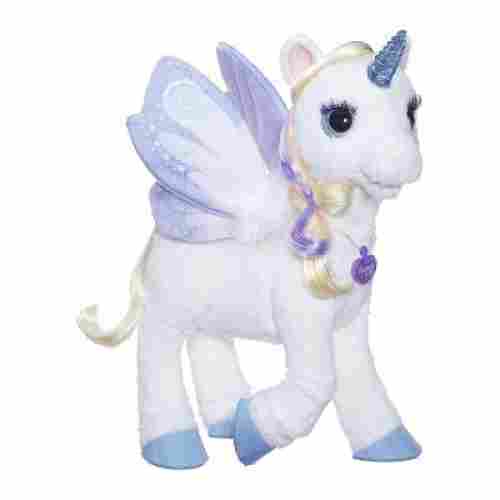 Fuel your child’s love of these magical creatures by purchasing them unicorn-themed toys. 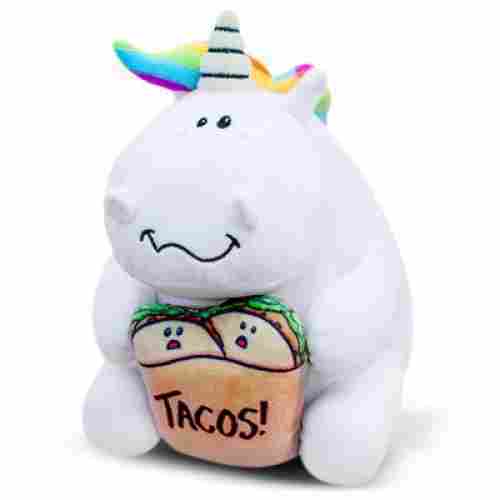 We created a list of the 10 best unicorn toys to help narrow your search. Whether you choose a plush or a figurine from the list, your little one will be able to stimulate their imagination by engaging in pretend play. Get ready for your house to become even more magical. Unicorns are fun and we want to make sure that you have the best unicorns in the current marketplace. This article has been reviewed and updated. The criteria to each product has been updated and the sections to each product have been updated to reflect the current style. Everyone gets a little feisty sometimes, including your cute kid and this doll is no different. 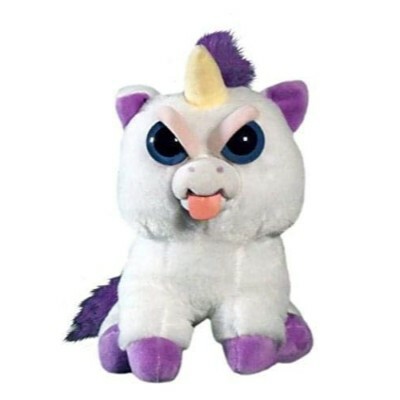 She is cute and has huge adorable brows, but once you squeeze her behind the eyes, she becomes one feisty unicorn. Although some kids though this was scary and had a freight, others thought it was absolutely hilarious and laughed their hearts out at the transformation this adorable unicorn toy. Glenda is a great companion and playmate for kids. They get to use their imagination as they create situations where Glenda will transform from cute to angry; learning the use of cause and effect as well as developing problem-solving skills. She is easy to carry around and is surface washable for easy maintenance. Her polyester fiber makes her soft and snuggly. Your little one will easily use their doll to communicate their mood whenever they feel a little angry themselves. This is a cute gift for kids above age four. 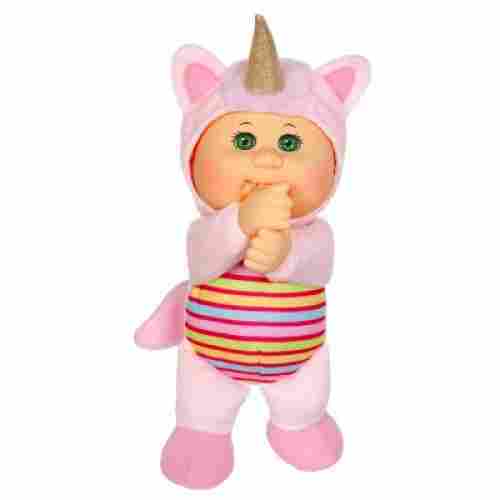 Cabbage Patch is a well-known and trusted brand that has been around for almost 40 years now! That’s 40 years of Huggable Happiness brought to children worldwide. 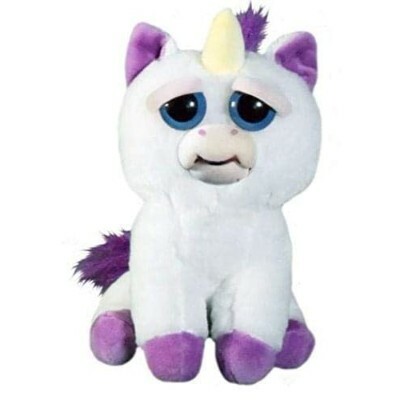 It would be only natural that they would come out with a Unicorn doll that’s just as cuddly and adorable. These dolls are meant to be seen as companions for when your child might need a friend -- one who can serve as a mirror and listen. Who can play and talk through the imagination. 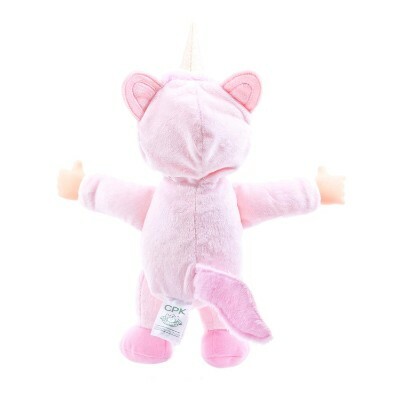 This Softbody doll has been given the unique outfit of wearing Unicorn Jammies! 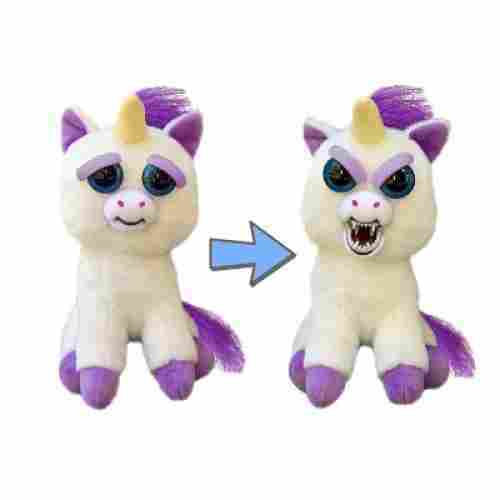 This brings in the imaginative play and fantasy of your cuddly friend making a transformation….or going off the land of unicorns in disguise so that he can observe them. This uniquely gender neutral doll can make him/her a fun buddy for both girls and boys. This can be perfect gift as bedtime doll, with matching Unicorn Jammies for your child! Or, it could just very well become a constant waking companion, too! The multicolored striping of the outfit, the golden horn of the hood -- which incidentally does slide off the doll head -- the cute little ears, and the adorably inquisitive look of this doll can make for sweet dreams at all hours. This is a brand name that parents can easily trust when it comes to quality! I’m sure many, if not most, parents themselves have played with Cabbage Patch Kids dolls. They nailed it forty years ago! Therefore, there’s a certain gold standard when it comes to customer satisfaction in the imaginative play department. The added benefit is the socialization skills scientists have observed in children who can have imaginary friends or playmates from dolls. This is a product of diverse usage. It fosters a strong sense of imaginative play, placing the child more in the fantasy by having an anthropomorphic doll dressed in a play outfit. Unicorns are mythical creatures loved not only by kids but their parents as well. A white horse with a horn is the usual representation of a unicorn, and a mysterious creature out of this world. Kids love them, as much as they love mysteries. 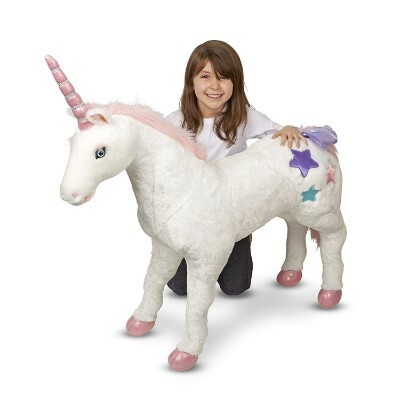 This giant unicorn will win the heart of any child and help develop their imagination. Their soft cuddly fabric makes them a great cuddle buddy for kids. Your kid will often hug their besties when they go on their magical adventures. This unicorn stands pretty on all four cute hooves for display. With decorative sparkly accents on the horn and hooves, a cute little bow on the bottom just before the long lustrous tail and little sparkly stars on the bottom make her a sight to behold. Your child will be developing their speech as they talk to their toy traveling to faraway lands to splash a little joy and magic. This unicorn is a great toy for kids ages three and above. It may seem a little big for younger kids, but it still makes a fun addition to their collection and décor for their nursery. This huge doll makes a great toy for kids who are learning how to speak. It a sturdy toy and will last a long time so your little one can go on countless adventures and have a huge huggable friend whenever they need one. FurReal Friends are a beloved brand by parents and kids alike. 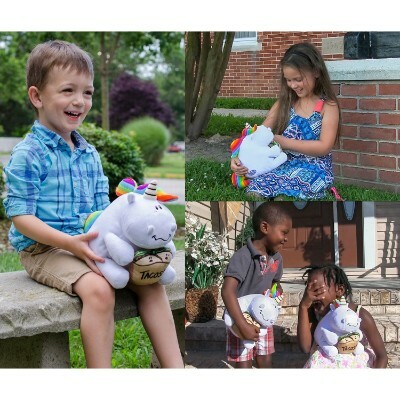 They have great stuffed animals from cats, to dogs and now a favorite for all kids, a unicorn. StarLily acts like a real animal so your kid will be super excited to play with her and treat her like a real pet. She enjoys petting and instantly lets your little one knows that she likes it which will only excite you kid during playtime. She has over 100 reactions to voice, petting and more. Unicorns are the most beautiful and cute creatures ever imagined. Depicted in colors white, purple and pink, unicorns are cute and elegant and StarLily comes in these exact colors which makes her so irresistibly whimsical. She will offer great company for hours, and it should come as no surprise if she becomes your kid’s best friend. StarLily loves it when her hair is braided to give it a fancy look so encourage your kid to experiment with different looks. It will help improve their motor skills. Also, the many conversations they will have together will nurture your child’s cognitive and social skills. StarLily is soft and loves to cuddle. Have your child and her little buddy practice great dance moves as StarLily responds to music for extra fun. We also love that kids can feed StarLily with her strawberry treats. This toy is any little child’s dream come true! 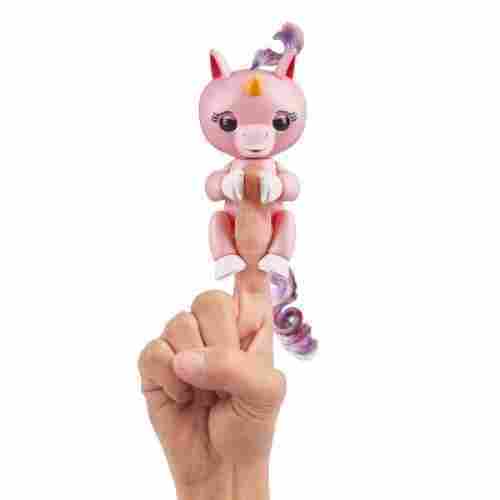 Your child’s imagination will soar with the Go Go Twinkle the Magical Unicorn. This VTech toy is designed with tons of cool features that will entertain your child for hours. 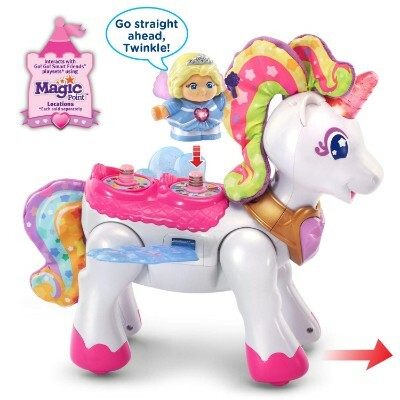 Pressing the buttons on the unicorn will cause her to walk forward, flap her wings, and move her head. 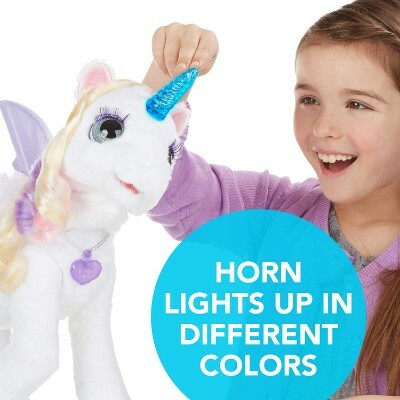 Not only does her horn light up, but it is designed to change colors as well. Along with Twinkle, your child will receive a toy fairy and a plastic carrot for added fun. Your child can stimulate their sensory skills with Twinkle’s pre-loaded phrases and tunes. Every time your little one presses her buttons, she will increase her fine-motor skills and hand-eye coordination. Composed of a high-grade plastic, this toy is durable enough for your little one to enjoy for years to come. 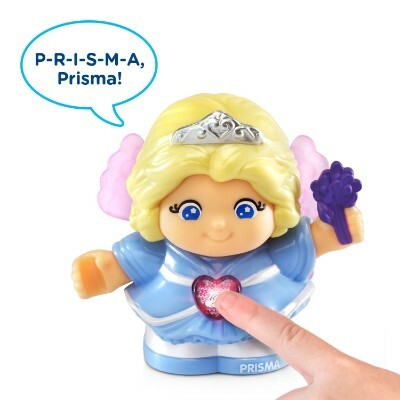 The two MagicPoints on Twinkle are the keys to your kid’s full enjoyment of this mythical creature. Twinkle is great for helping kids develop a variety of their skills and competencies so they’ll grow up to be brighter and more emotionally stable individuals. If your child is a fan of horses, chances are they have a couple of Schleich horses in their collection. 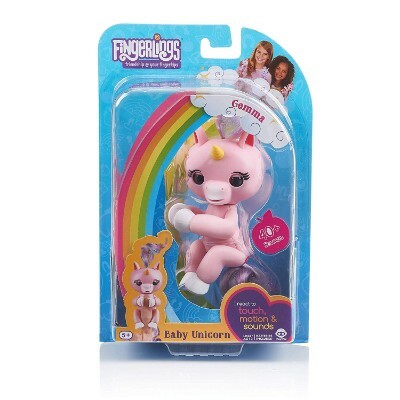 Now you can add a unicorn to the mix with Schleich’s Rainbow Unicorn Foal. Hand painted all white with a rainbow-colored tail, this toy is beautifully crafted. Colored gemstones have been added to the hind legs of the unicorn to further increase its beauty. It has been designed with the ability to stand freely, thus your child can play with it hands-free. 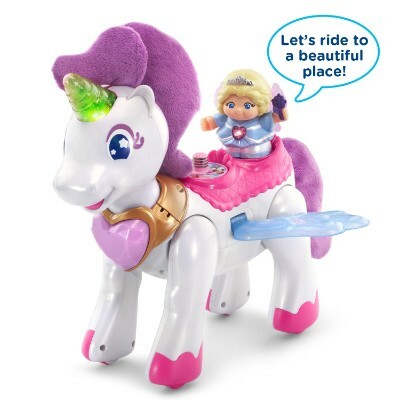 Composed of a high-quality plastic, your little one will be able to enjoy countless adventures with this unicorn. The small details will stimulate their imagination and encourage them to engage in pretend play. It has been designed to fit perfectly in a child’s hands, thus younger child will have no problem grasping it. It is crafted so beautifully that it can easily double as decor in your child’s room. We find this toy to be very affordable as it costs less than $10 and is beautifully crafted and highly durable. The attention to detail in the design of the unicorn will stimulate your child’s imagination and provide them with hours of fun. Fun, funny and cuddly is the best way to describe this bright colored adorable buddy. While exploring an enchanted forest, he found a wild taco and things have never been same again. 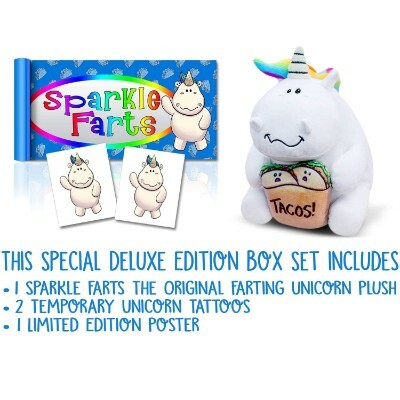 Sparkle Farts comes in a soft, huggable material that automatically makes your kid want to squeeze him in a bear hug. He is fitted with a sensor and speaker and is prompt to warn your little one not to squeeze too much, or he will fart. When he does, it's not only fun but hilarious! This toy offers your child a great way to keep their mood elevated. They will be laughing and giggling all through their playtime with this awesome unicorn. Whenever they are in a foul mood, squeeze this little guy, and your little one will have no choice but to burst out laughing, making it a great way to cheer them up. 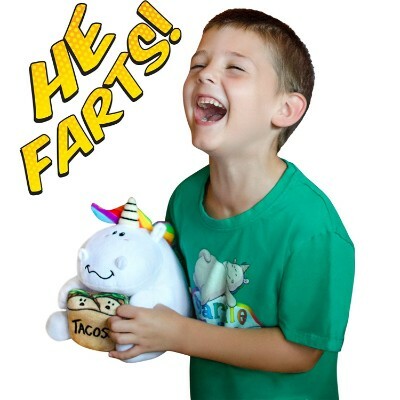 Playing pranks will never be the same again with this original fart unicorn. Your kids will an exciting time with this toy as they try to prank each other or get you! Each box comes with a mystery price. The toy is made to last so your little one can have it for long and keep their giggle whenever they squeeze their toy. With the Schylling Unicorn Tin Tea Set your child’s next tea party will be nothing short of magical. This tea set comes with fifteen pieces which breaks down to four complete place settings, a dessert tray, and a teapot. All of the pieces in the set are lightweight, thus your child will easily be able to serve their friends. Each piece is designed with bright colors and decorated with rainbows and unicorns. When purchasing you can choose from over ten different designs for your tea set. Watch as your child’s social skills improve with every tea party they host. Even if they decide to host a party with their stuffed animals, the set will still be stimulating their development as it is encouraging your child to use their imagination. The teapot is designed with a removable lid that makes it easy for your little one to pretend to fill up the pot. Their fine motor skills will increase as they grasp the different pieces in the set. With four complete place settings included in this set, your child can easily enjoy having tea with their friends. The bright colors and kid-friendly design with have every unicorn loving kid excited for the tea party. 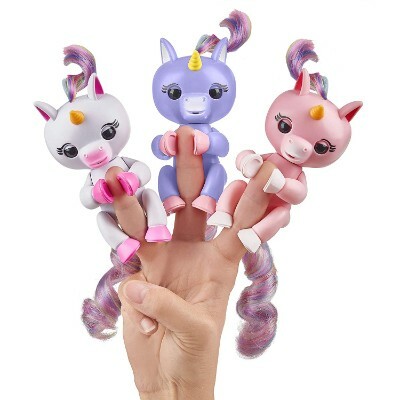 Choose from three cute little unicorn pals: Gemma (who is pink with a rainbow mane and tail), Alika (purple with a rainbow mane and tail), or Gigi (white with rainbow mane and tail). These tiny buddies love to hang onto your finger and respond to noise, motion, and contact with a variety of little noises, head turns, and eye movements. Pet them to help lull them to sleep or excite them with loud music or sounds. They will react differently based on if you hold them upside down or right-side up, and when you blow them a kiss, they’ll blow one back! This travel-size companion is a great way to keep children occupied on trips or while running errands. The toy is small but fits around their finger like a ring so you won’t have to worry about them losing it. Kids love having a little buddy tagging along to chat and explore with. It’s a cute, simple little toy that your family can tote around with them without worrying about putting it down somewhere and forgetting it since it basically functions as a ring. Pets are no longer just animals we keep at home. These creatures have become a very important part of today’s life that many have pets go with them wherever they go. These pets are always placed in pet carriers so they also get to enjoy the experience of being considered as a member of the family. 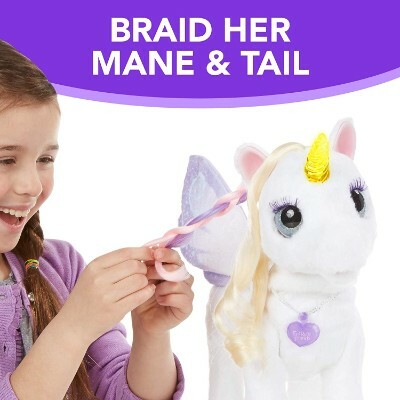 While kids may not have the responsibility for caring for these pets yet, we can somehow teach them by giving them the Unicorn Fancy Pals Pet Carrier. This make-believe pet carrier is designed like a fashionable tote bag that is large and spacious enough to carry a child’s pet unicorn with fluffy fur and a golden horn. 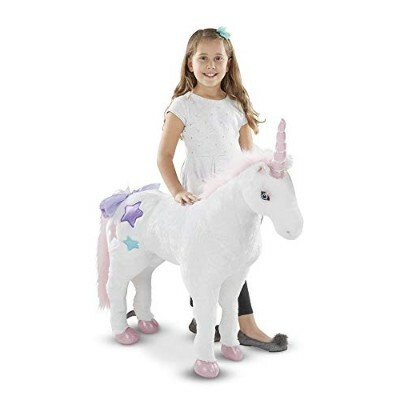 The mystical nature of unicorns should be readily recognizable in the Fancy Pals as your kid will surely be bringing and spreading the magic of these good-natured, single-horned creatures in places where kids spend the greatest times of their lives. They can bring the Fancy Pals anywhere. Travel time will never be a bore again as kids now have the company of one of man’s most fabled creature. Socialization skills are probably the most vital ones that tend to be focused on and managed within in the life of your child. Down to the tiniest detail. Whatever will the be the easiest transition and integrative normalization of what goes on in the adult world. We’ve all seen Paris Hilton toting her cute little dog…..(and, he was CUTE!). Since then, this trend has become the rage with celebs and normies alike. With every pet now having such an up close and personal relationship with their owner, the need to prepare your child for the responsibility is incredibly important! So, why not start out with her Unicorn Friend? The carrier itself has a simple and inviting design. The purple bordering and butterfly ornament give it even more of a mythical flair! The Unicorn Fancy Pals Pet Carrier is one fabulous way to help children role play how to take care of a magical pet. This helps them prepare for the bigger role of being pet owners in the future. When we asked the kids of our team of researchers what kind of unicorn toy they would like to have, we were quite surprised and pleased at their answers. And this provided us with a very clear direction of what we need to look for in the different one-horned horse playthings to include on this particular list. We then correlated the remarks of these kids with customer feedback and product reviews, making sure that no product with a satisfaction rating of fewer than 4.1 stars ever made it to our final list. Of course, it wasn’t always easy because even with this high-enough cut-off score, there was still quite a handful of them. Toys are not only intended to be played with. These must also serve a specific purpose which may not be readily apparent. As such, we took the liberty of determining the developmental benefits of these products on kids. It was imperative that these playthings addressed at least one area of childhood development to gain a spot in our list. The more developmental benefits the plaything provides, the better were the chances that it is to be placed in our top 10. Of course, safety is also important, especially for very young kids. The process used in the design and manufacture of these play objects were evaluated for the safety of the materials used and the overall integrity of how the different components were built. One of the major concerns of parents everywhere is the exposure of kids to harmful chemicals and potential choking hazards from these toys. We made sure there were none of that. It doesn’t hurt that the unicorn phenomena has become a trend among adults as well as kids! This makes it much easier on the creative side of the research criteria that comes up in the development of most of these toys. It can range from just a plain unicorn, to Pegasus the Unicorn! If that’s not quite your speed, we add elves to the mix! The elf can transform into a unicorn! Your child becomes the unicorn or the elf! Your child can ride the unicorn! Your child can imagine themselves in the realm of the unicorns, either as a participant or an observer! With all of the basic criteria met and out of the way, the focus can get to the fantastic….which is what product itself is all about. The unicorn itself is a stretch of the imagination. So why not stretch it out even more to the benefit of child development?! With it already dancing or prancing around in the psyche of the culture for the last 1,000 years, we can give it the update that it deserves for generations into the next millennia. It’s as basic as reading a story to your child that begins with “Once upon a time.” What has changed?! With timelessness of something like the Star Wars franchise, which keeps reinventing these old tales of mechanized “flying horses,” knights and bringing light to the universe, the research took us as far back as a storybook and as far forward as the possibility of interdimensional travel! The thing that remains constant, the thing that remains the same, is the interdimensional travel of the imagination in the present! This is the thing that is so vital to the development of your child and how balanced he or she will be and become. In our current era, a lot has gone into creating toys that non-gender biased, as they should. The result of this has been the resurgence of the unicorn and dragon lore. There’s pretty much a unanimous agreement that neither a boy’s nor a girl’s brain processing these two creatures differently from other toys that might require either mechanical aptitude on the one hand, or an ability to nurture on the other. Playing with characters and toys like unicorn characters is a great way to develop their imagination. It allows them to explore the ideas and the environment around them through play. Developing fine motor skills to increase grasp always sounds so boring, but with characters and open play with toys like unicorns always kids to develop their fine motor skills without even knowing they are. From dwarves and elves to hobbits and flying horses and horned steeds, many children’s stories are riddled with fantastic creatures that are best left to the imagination. While we can only say that these are mere fiction, many children believe them to be true. Mythical creatures like unicorns and winged horses have fascinated kids for many millennia. They have formed the backbone of the imaginative potential of kids. It is for this reason that experts believe children’s belief in myths is healthy. It doesn’t really matter whether it is believing in unicorns or Santa or elves, children can reap quite a handful of benefits from believing in these myths. But why is it important, anyway? Everything has something to do with a kid’s imagination. This is a cognitive process that defies logic for the simple fact that it doesn’t have to be based on observable truths. For instance, believing in the existence of unicorns doesn’t require the presentation of solid proof. One only needs to conjure images in the brain to create the much-needed proof. This requires making complex cognitive processes that take into account a variety of factors including memory, logic, and experience. These are then fully integrated into one simplified interpretation of the concept such that a unicorn is a horse that has a horn. It may seem simple enough but the process of coming up with this generalization is complex. It is in these processes that children are able to hone their cognitive skills, paving the way for more complex cognitive abilities like critical thinking and divergent reasoning. So, the next time your child believes in something as far-fetched as a unicorn, let him or her be. It’s a cognitive exercise for your child. q: How much thought has gone into the development of these toys? It all varies from manufacturer to manufacturer! Some of these toys can be perceived as “low-grade” based on reviews….unfortunately, there will always be haters no matter how fantastic a product can be. Other manufacturers are quite thoughtful and do extensive research. For instance, Schleigh is one of the best! Sometimes the quality of the item is reflected in the price. It is recommended that you look at many reviews from various sites before purchasing. 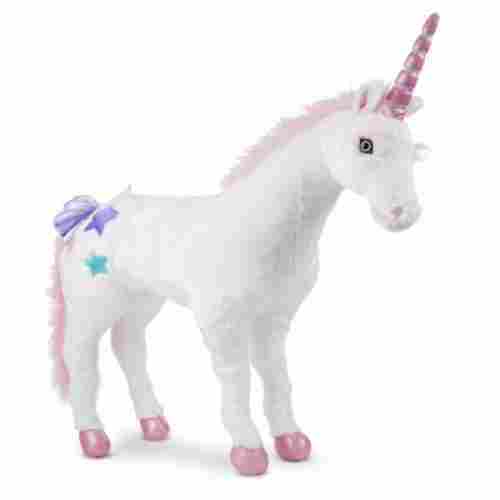 q: Is a high-priced collector’s Item like a Schleigh unicorn really appropriate for a child? It can be! It’s your call as a parent. As far as having an item that will grow with your child, no one could ask for anything better! If the parent starts early on teaching and showing an appreciation for quality items, then this value will be passed on to the child. It can be seen as a lesson in responsibility and caregiving for things that come into your child’s possession. q: Is there any use in getting fantasy-themed toys for an infant? It’s true that they might not recognize something like a unicorn, since their brains haven’t developed enough to differentiate...but, the suggestion is to begin socializing them as early as possible! We all know that unicorns are pretty much in our cultural DNA at this point. So, if you can combine this with a practical toy that strengthens physical and cognitive development--then that’s the pot of gold at the end of your rainbow! q: How do I find the “right” product for my child? The products we’ve shown have a wide range. Mostly, it depends on the developmental needs of your child! Some kids tend to be more analytical, so we have something like the Mosaic puzzle that uses a cross-stitched letter-to-number variable pattern. Other kids are more kinesthetic, so we get the cuddly soft dolls and unicorn animals. For the mechanically minded, there’s the introduction to a gyroscopic flying unicorn. With an age range from 6 months to 6 years, there’s a product for each stage of development that can touch each interest. q: Is there a connection between my kid's imagination and unicorns? Unicorns are magical, and they represent mystery, finesse, grace, and strength. Their presence as toys symbolizes the power of imagination. Through play, kids have the ability to form mental images where they live or play with their mythical creatures. Such imagination is the ultimate creative power and is a key ingredient for your kid’s development. q: Are unicorn toys suitable for outside use? Although these wonderful bouncy unicorn toys are obviously primarily for indoor use, there is no reason your kids can’t enjoy them outdoors. However, it's best to avoid exposing these beautiful creatures to elements. Although relatively durable, they won't take much abuse or heavy usage. q: Do unicorn toys have any educational benefit? Yes, they do. Kids are eager to learn about the world around them, and unicorn toys present a safe and stimulating way to discover their senses. 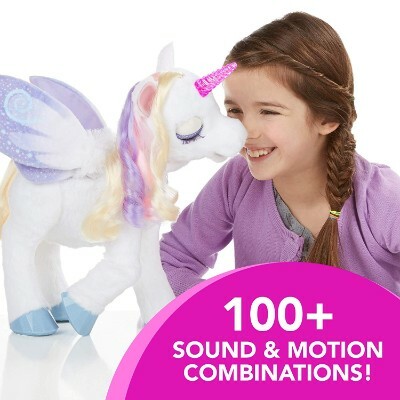 Every new shape, color or shape of a unicorn toy is a learning experience for kids. 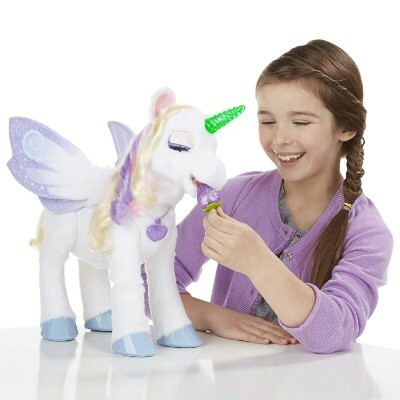 Unicorn toys offer a magical way to help your kids recognize familiar words and learn empathy along with language and rehearse different situations.